Spotify is a music streaming platform that started in Sweden in 2008 as an attempt to combat online piracy. Over the last decade, it has grown and earned a loyal user base and a positive brand image. It now operates in 61 markets worldwide and has over 140 million users and over 30 million songs. Although many marketers are familiar with Spotify in their personal lives, many do not realise that the platform can be leveraged in much the same way as Facebook, LinkedIn and Google – to target ads at relevant users in order to achieve those all-important marketing goals. If you have not considered advertising on Spotify, then the worldwide popularity of the platform makes it worth thinking about. Here are four ways you can advertise on Spotify. Audio ads on Spotify are 15 or 30-second audio messages accompanied by clickable banners displayed in the player’s viewport with a URL leading to your target content. These ads are played between songs. There are two types of Video ads on Spotify: Video Takeover Everywhere and Sponsored Sessions. Video Takeover Everywhere is similar to the main audio ad option, displaying video ads between songs. Sponsored Sessions is triggered when a user consents to viewing your video ad in exchange for 30 minutes of ad-free listening. Display ads on Spotify offer various types of web banner solutions. These include the Overlay (i.e. when the player is paused and the user comes back to the app); the Homepage Takeover (i.e. where the banner is featured on the main screen of the desktop app for 24 hours); and the Leaderboard (i.e. 30 seconds of exposure to your clickable banner). Sponsored ads on Spotify allow you to associate your brand with one of over 400 curated playlists. The wide selection of playlists lets you connect with lovers of the particular music genre you want to be associated with your brand. The option enables you to feature your branded content and in-playlist campaigns for a week. With millions of followers and over 1 billion streams per week, this type of engagement with your audience can certainly be appealing. I hope this has given you a useful introduction to how to advertise on Spotify. For more in-depth information, read our free guide below. 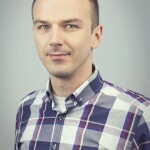 Grzegorz is a Front-End Developer at Webcertain, working on web and design projects for both the company and external clients. He graduated in sociology in his home country of Poland, and later worked in many different positions, mainly in the creative industry. Apart from various development-related subjects, his interests revolve around technology, 3D graphics and travelling. Grzegorz now lives in the UK.